Reach all of your readers, wherever they are, when you master 130 years of clear-writing best practices at Write for Readability, our clear-writing Master Class in Minneapolis on June 4-5. Can you read me now? 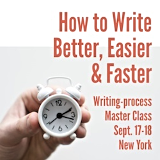 Learn to make every piece you write easier to read and understand at our two-day clear-writing Master Class in Minneapolis on June 4-5. Directions, Maps and parking information. Please contact hotels directly for room rates and booking. Your ticket includes morning coffee and tea, lunch and afternoon refreshments. Ready to learn to make messages measurably more readable? Save $50 each when you bring one colleague. Your registration is not complete until you have paid in full. If your company requires an invoice, please use either the printable invoice or the email confirmation you will receive. Both will include the details of the workshop, including the dates and the workshop fee. You may pay by credit card or check. Send a colleague. We’ll miss you! But please feel free to send a friend in your place. No charge for substitutions. Transfer to a different Master Class. Choose one of our upcoming workshops. No charge to transfer. by April 4 to receive a full refund, minus a 20% handling fee. by May 4 to receive a 75% refund. Sorry, no refunds after May 4. We reserve the right to cancel workshops. If we do, we will apply your registration fee to another workshop or refund your fee. But we will not be responsible for any additional costs you have incurred, such as airfare or travel expenses. You’ll receive confirmation of your registration by email. Please white-list Ann@WylieComm.com and orders@eventbrite.com to make sure you receive your registration materials. If they don’t arrive within an hour of your registration, please contact us directly. Our Master Classes sell out quickly. If you’re interested in attending, please act now. May I pay by check or purchase order? Yes, please contact us at Ann@WylieComm.com. Let us know how many and what type of tickets you need, attendee details and your preferred payment method. We will issue an invoice or purchase order if you need one. Save $100 if you’re a Rev Up Readership member. (Join Rev Up Readership.) Save $100 if you’re a PRSA member. (Join PRSA.) Click “Enter promotional code” and enter your promo code. I booked my ticket without applying the discount code. Or I received the code after booking the ticket. Can I get a refund for the discount? Sorry, but you need to apply the discount code when you purchase. We are not able to apply discounts after the fact. — Blythe Campbell, director, communications and marketing, NANA Development Corp. I booked my individual ticket, and now I’m bringing colleagues. Can I still get the group discount? Please email us, and we’ll send you a special discount code your colleagues can apply to get the discount. Yes, please bring one. You’ll need it to edit your work and get feedback from your peers and Ann. Should I bring my writing sample to the workshop? Yes, please bring your writing samples to the workshop. You’ll write, rewrite and edit and leave with a totally rewritten piece. Please email us at Ann@WylieComm.com. May I update my registration information? Yes. Please go to Eventbrite and update your registration information and dietary information. Should I bring my printed ticket to the workshop? Yes, please bring a copy of the ticket to the workshop. Do you accommodate special dietary preferences? Please specify your dietary preference when you register. Can you you accommodate special needs (accessibility, nursing mothers, etc.)? Yes, we will do everything we can to accommodate your request. Please contact us by email and let us know what you need. Do you have any advice on what to tell my boss about why I should attend this writing workshop? Here is a draft letter that you can use to help convince your boss. Also attached is a one page fact-sheet about our workshop. PRSA members: Earn 4 APR maintenance points.